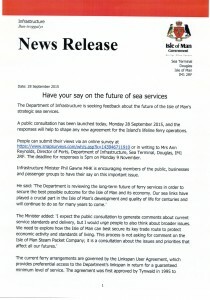 The Department of Infrastructure have issued the news release below with a link for people to submit online comments. This is an opportunity to have your say. 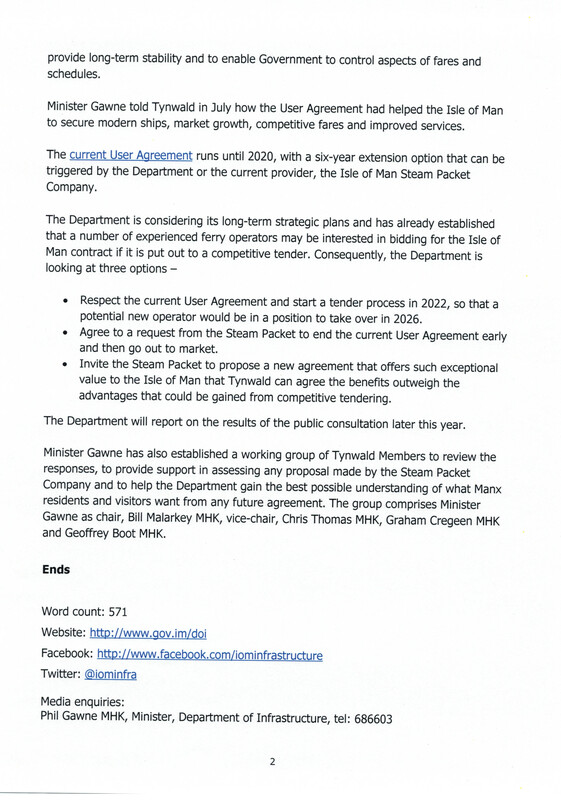 I know that the cost of ferry services is something raised frequently and in this respect you will note that the Minister has appointed me to a working group of Tynwald members to review the responses and provide support in assessing any proposals made by the Steam Packet. Please respond if you can, I for one would like to get a real feel for where we are and should be going. This entry was posted in Uncategorised on 29th September 2015 by geoffreyboot.org. 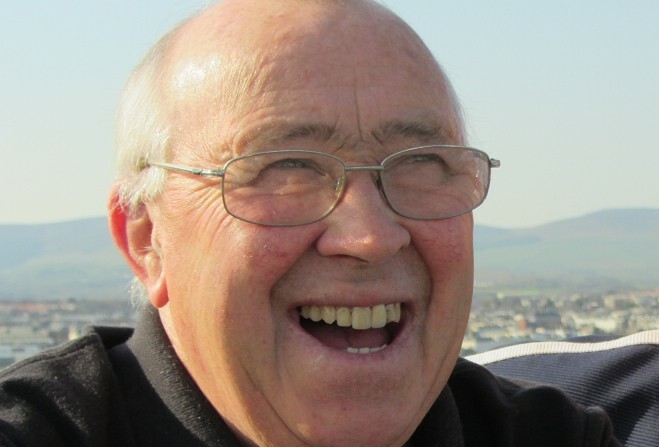 Many of you will have already heard of the sad passing of John Kennaugh yesterday at the age of 77. Compared to others I did not know John for much of his life and it wasn’t until recently when we were fellow Commissioners that I really got to know him. Many people I know grew up with him and indeed before I became engaged in public life he was the voice of farming and TT on the radio and ever present in the community as Captain of our Parish. A man of small stature he was big in word and deed. A true Manxman who has left his mark on all who knew and dealt with him. A dedicated farmer, Christian, commentator and always willing to go that extra mile for our community. The Island has lost a great man and mine and my wife’s sympathy and condolences to his wife Margaret and family. This entry was posted in Uncategorised on 22nd September 2015 by geoffreyboot.org. A welcome break in the afternoon for a visit to the hosted by Donald Cannan, who as always was an entertaining and convivial host. 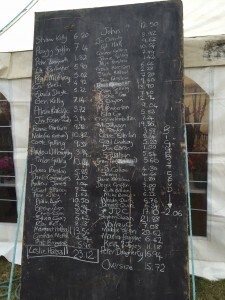 Apart from the wonderful displays and competition entries the highlight for Suzie and I was the big spud competition, won by Leslie Halsall with 23.12 lbs. This has encouraged Suzie and I to try again, we gave up a couple of years ago when blight took our potatoes very early in the growth cycle. This entry was posted in Uncategorised on 18th September 2015 by geoffreyboot.org. Morning meeting with Laurence Skelly MHK Minister for Economic Development, an interesting insight and rather encouraging. Can You Vote? 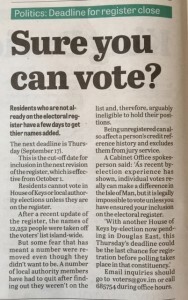 – a timely reminder in this weeks Examiner especially as so many people were missing from the electoral roll during the by-election. 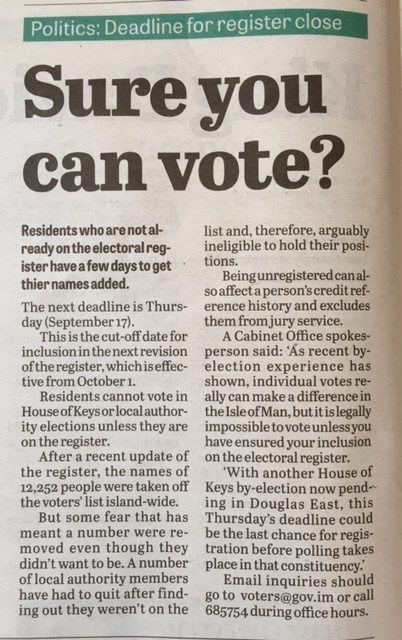 The next deadline is this Thursday and email enquiries can be made via voters@gov.im or telephone 685754. There will be other opportunities before the next general election but with my resignation as a German Commissioner there will be a by-election in German within the next 6 to 8 weeks in which some people may wish to vote. This entry was posted in Uncategorised on 15th September 2015 by geoffreyboot.org. Monday 14th Induction Day – a lot of information and a steep learning curve but enjoying it followed by my first pubic engagement. Suzie and I attended the prize giving at the QE2 School. What a superb school, it was my first proper visit. An excellent Head and staff, which reflects in the superb end of year results. Congratulations to all the students who won prizes and there were a lot of them. Proceedings were slightly marred by a spurious fire alarm which did however prove the evacuation process works well even in heavy rain! The morning after the night before! A short but intense campaign and one where I have really learnt that every vote counts. A very close result but a win is a win. Thanks to my dedicated team and also my wife for her commitment now and for the future. The work begins today and judging by my inbox there is plenty of it. 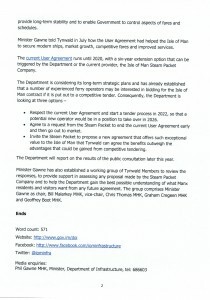 I will keep you posted and thank you very much for your trust and support. Geoffrey Boot Glenbafa’s new MHK – sadly the last as next September we will be a combined constituency with Peel. This entry was posted in Uncategorised on 11th September 2015 by geoffreyboot.org. Election Day! An early start and Suzie and I have cast our votes. 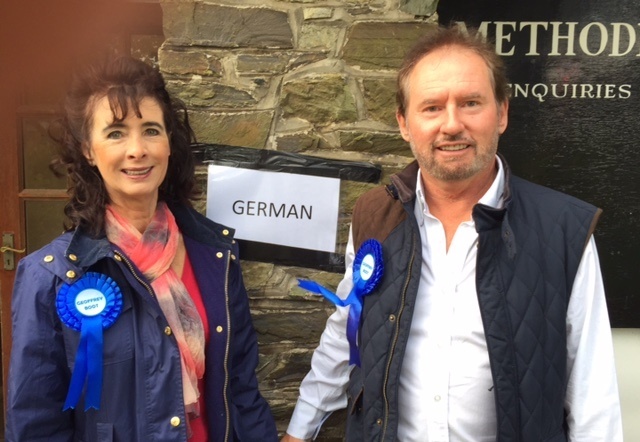 The team are deployed and now its down to the electorate. This entry was posted in Uncategorised on 10th September 2015 by geoffreyboot.org.